A melting pot of nature and adventure in picturesque settings, Tenorio Volcano National Park in northern Costa Rica has it all. Regardless if you have 1 day or 1 week, this area has a lot to offer in terms of nature, wildlife and active adventures. 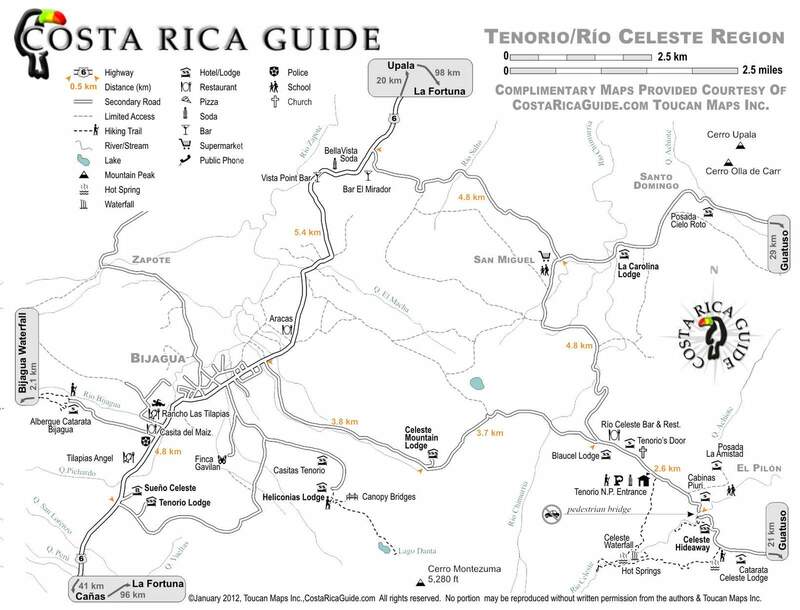 After an amazing breakfast at Celeste Mountain Lodge, you can walk directly to the Rio Celeste park entrance. On the way don’t be surprised if some locals offer you a lift, people are very easy going and friendly. At the entrance to the park, you’ll have to pay an entrance fee of around $10. The waterfall and river hike is such a contrast compared to other rivers of Costa Rica. You’ll be surrounded by lush rainforest and turquoise blue water. The water is this shade due to the sulphur from the volcanic activity combined with the calcium carbon. 7.5km or 1.5km hike. You choose! Both hikes take you directly to the waterfall and from there, you have the option to either go back or carry on further up the river. If staying at Celeste Mountain Lodge, then there will be an additional 8km round trip (4km one way). It might be very muddy and slippy, so ensure you wear suitable footwear! Do you need a guide? It is possible to do this without a guide, the trail is well marked out. After spending day 1 hiking, take the opportunity on day 2 to let an inflatable ring do the work! Tubing the Rio Celeste will take you through a mixture of calm turquoise waters to faster flowing rapids, while having the dense rainforest by your side. If you’re lucky, you’ll see monkeys and other animals within the forest as you float on by! Be sure to take swim wear, sandals or surf booties, insect repellent, sun screen, towels and a change of clothing! After breakfast, drive to the Heliconas Lodge where you can start a journey that will surround you with a vast range of animals, flora and fauna. This will take you from dense rainforest to a volcanic crater and hanging bridges in a cloud forest. Before you access the trails, you will be required to pay a fee of approximately $15 per person. Be sure to check the conditions of the trail and bridges with the lodge, as these can change due to weather events such as hurricanes. As you leave the Heliconas Lodge, you’ll embark on a steep and sometimes muddy path towards the crater. The hike is approximately a 5km round trip through dense rainforest. Be sure to watch where you are standing as we passed snakes and insects on the path. Always stick to the path! You can find a basic map here. During the hike don’t be surprised if you pass no one. This just makes it more of an adventure! Did you ever wonder what the monkeys of Costa Rica see as they are hanging high up in the canopy? The hanging bridges will enable you to experience the forest from a different perspective. As you come to an end of the Lago Danta hike, you can then directly join the hanging bridges circuit that will loop back to the Heliconas Lodge. Be sure to wear long sleeved clothing, suitable (closed toe) footwear, insect repellent and sun screen! The mosquitos loved a nibble in this area!